Silk, backed and lined with linen; embroidered with silk and chenille and appliquéed with painted silk medallions. 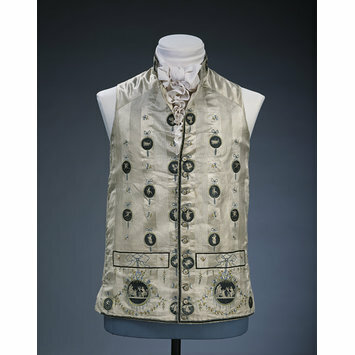 The influence of Neo-classical design is evident in the decoration of this waistcoat of the 1780s. Embroidered floral garlands and ribbons, elements of late-18th century decoration, adorn the pockets. Medallions of twill silk minutely and skilfully painted in black with mythological classical figures have been applied to the front and collar. The square-cut shape, standing collar and welt pocket are characteristic of the waistcoat styles in the 1780s. A man's sleeveless waistcoat of square-cut shape with a stand collar and a pair of welt pockets. The front sections of the collar and the left and right fronts of the waistcoat are cut from ivory silk, woven with a broad vertical satin stripe alternating with a group of twelve vertical narrow stripes. The back of the collar, shoulder pieces, underarm panels and facings are made of plain ivory silk satin. The waistcoat is lined and backed with linen and the back has three pairs of linen tapes to adjust the chest size. The waistcoat fastens with twelve small buttons covered with ivory silk satin and embroidered in polychrome silk with a flower head. The two front collar parts, front edges and hem are finished with a narrow border of black chenille edged with coloured chenille thread. This has been turned to the inside and stitched down at the centre left and right front of the collar to reduce its height. 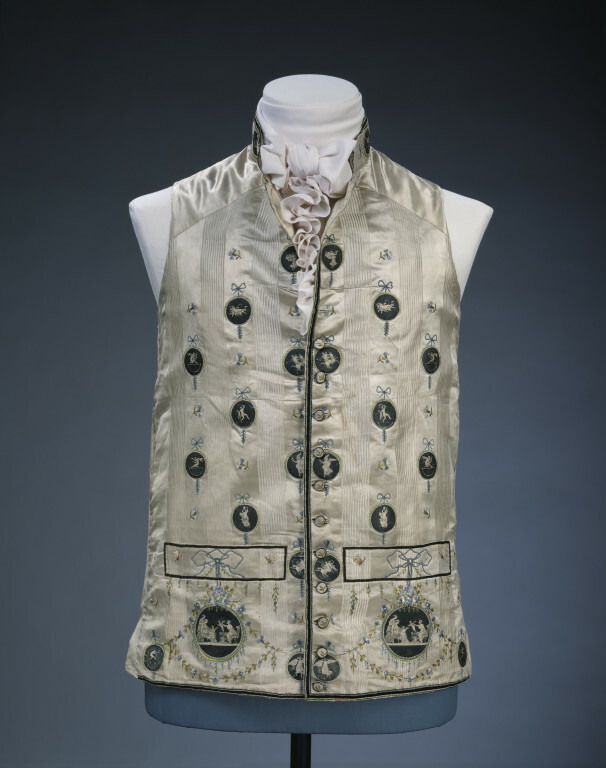 The waistcoat has been appliquéed with circular medallions of ivory twill silk which have been painted in black with classical images derived from the first three volumes of Le Antichità di Ercolano (1757-1792). The medallions, which depict centaurs, satyrs and bacchantes (Maenads) dancing and making music, are suspended from embroidered floral garlands and bows and are arranged symmetrically in twelve pairs across the waistcoat fronts. A larger pair of medallions set beneath the pockets depict the Cupid Seller. Although the subjects of the medallions were drawn from wall paintings the creation of a dense black ground throws the figures into relief to create the effect of cameos. The embroidery, which is worked over black outlines in polychrome silks and chenille, was executed after the medallions were applied. The buttonholes were cut after the waistcoat was embroidered. All the figures in the medallions are copied from prints showing recently discovered Roman wall-paintings, from the nine volume work Le Antichità di Ercolano (1757-1792). The two larger medallions below the pockets show The Cupid Seller, discovered at the Villa Arianna in Stabiae, a subject much copied after its publication in 1762. Other images are drawn from wall paintings found at Cicero's Villa in Pompeii. The waistcoat was formerly in the Robinson Collection.